Moonshadow is a realm of Oblivion, created and ruled over by Azura, the Daedric Prince of Twilight. The realm is so beautiful that visiting mortals are half-blinded. The realm contains flowers and waterfalls, majestic trees, and a city of silver. The wind smells of perfume, and the realm is known to have rain. Azura lives in a rose palace, and is welcoming to mortal travelers. The Winged Twilights inhabit this realm. Moonshadow is also another name for Azura. Mortals born under the sign of The Shadow are known to have the ability to turn invisible; this ability is called Moonshadow, although it is unknown if it has anything to do with the Daedric realm. In a speech to the Champion of Cyrodiil, Mankar Camoran incorrectly names Mephala's realms the "ten Moonshadows". 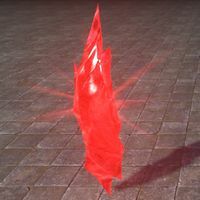 During the Second Era, the Ashlander inhabitants of Ald'ruhn had come into possession of several Crimson Shards of Moonshadow, large red crystals which glow with a powerful red light. Several pieces of armor of Daedric quality found in Tamriel are thought to have originated from Moonshadow; they are enchanted with a strong magical light enchantment, but are otherwise unremarkable. ^ Moonshadow gauntlets and shield in Oblivion.